This book is intended for use by both academic and behavioral health care programs. 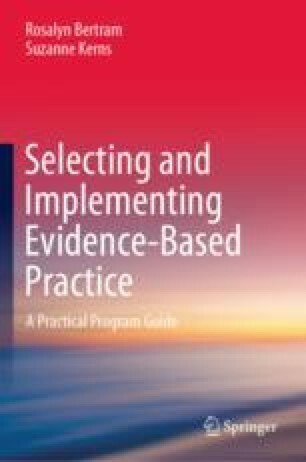 This chapter maps what readers will learn about the discourse in behavioral health care, social services, and academic programs as they sought to clarify and embrace, to provide and teach the selection and implementation of evidence-based practice. Throughout the chapters, we identify content and processes to improve workforce preparation and behavioral health care service provision. Our premises are simple. Evidence-based practice is logical and, when well implemented, is effective and sustainable. Eclectic practice is neither proven nor sustainable. Sound research can easily be explored to identify effective practices that, if well implemented, can be sustained to improve consumer outcomes in less time and at less cost.